Putting common misconceptions aside, summer is not over just yet. The end of August into September is one of my favorite times with crisp beach days, less humidity, an abundance of leftover tomatoes, and the start to oyster season. Over Labor Day weekend, I’m looking forward to gathering with friends for a sunny, outdoor breakfast. Inspired by a dish that Kara and I threw together while down on the Hamptons, I’m planning to fan sliced avocado below soft scrambled eggs with a sprinkling of pickled shallots and touch of hot sauce. Fresh tarragon and creamy goat cheese add depth to the scramble and I never thought I would eat pickled shallots for breakfast but after a close friend, Taryn introduced the idea, I have been adding the tangy punch ever since. The simple layering of flavors and textures is a burst of colors on your palette, I mean plate. Served alongside grapefruit Mimosas and sliced peaches drizzled with honey and hazelnuts, the ambitious toasts are a fun and vibrant start to a day of leisure. Combine the shallots, red wine vinegar, honey, salt and pepper in a bowl and let sit for at least 20 minutes. In a large bowl, crack the eggs. Add the milk and whisk until the yolks are broken and almost completely combined. Heat a large nonstick skillet over medium heat. Melt 2 T butter until it foams, then pour in the eggs. Reduce heat to medium low and slowly stir the eggs with a wooden spoon. Once the eggs begin to set, add the cheese, salt and pepper. After 10 minutes or so when large curds have formed, stir in the fresh tarragon, and remove from heat. Meanwhile, toast the sliced bread and spread with remaining butter. 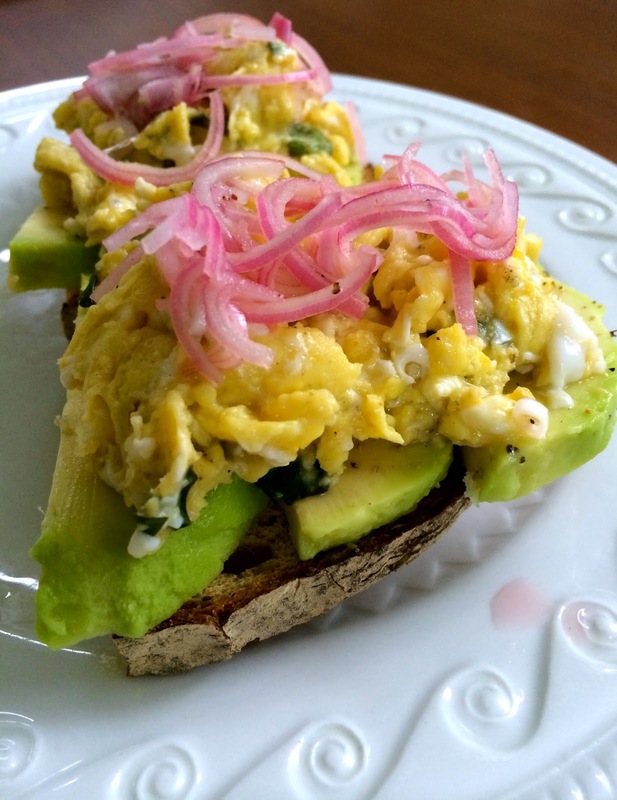 To assemble the open-faced toasts, layer a few slices of avocado atop the toasts, distribute the scrambled eggs evenly on top of the four slices, distribute a tiny spoonful of the pickled shallots on top, a dash of hot sauce, salt and black pepper. Serves 4.